Tauy Creek: Do They Only Have the One Chair? "He knows the genealogies of English kings, the birth names of all five Marx Brothers, the Köchel numbers of the major works of Mozart, the batting averages of the top-ten all-time hitters in both leagues, the differing effects on Superman of the various colors of Kryptonite. He has read every important book, seen every major film, listened to every great symphony. When we listen to classical music in the car, he whistles ostentatiously along with even the most complex and atonal themes. He remembers people’s names, details, and particulars. 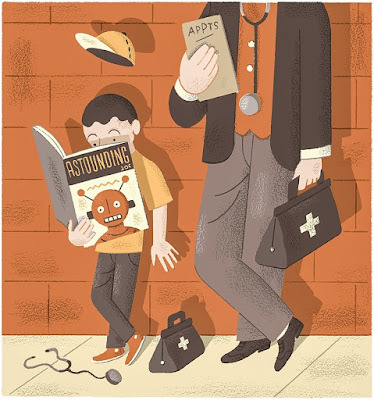 When examining an anxious young patient, he is able to call not only on large swaths of medical knowledge but on a disarming command of pop-cultural information that helps put both children and their parents at ease: he knows the name of Underdog’s archenemy (Simon Bar Sinister) and of Barbie’s little sister (Skipper); he keeps up with the intricacies of daytime soap operas and baseball box scores. There is really no point, I have already decided, in even trying to pass myself off as a doctor, a would-be doctor, or a pint-size future version of my father. No matter how hard I try, and this is an assessment my father seems to share, I will never know as much as he does or be as intelligent as he is. “You are a very smart boy,” he has informed me, a few times now, after I came out with some unexpected fact or precocious bit of perception. “Of course, you’ll never be as smart as me,” he always adds, smiling in a way that seems apologetic and mocking at the same time." Michael Chabon has a new piece in The New Yorker, "The Recipe for Life" about his father. You can read the rest of it here. Chabon's new book of essays Pops: Fatherhood In Pieces, is out in May. I don't understand the weatherperson's last two panels. 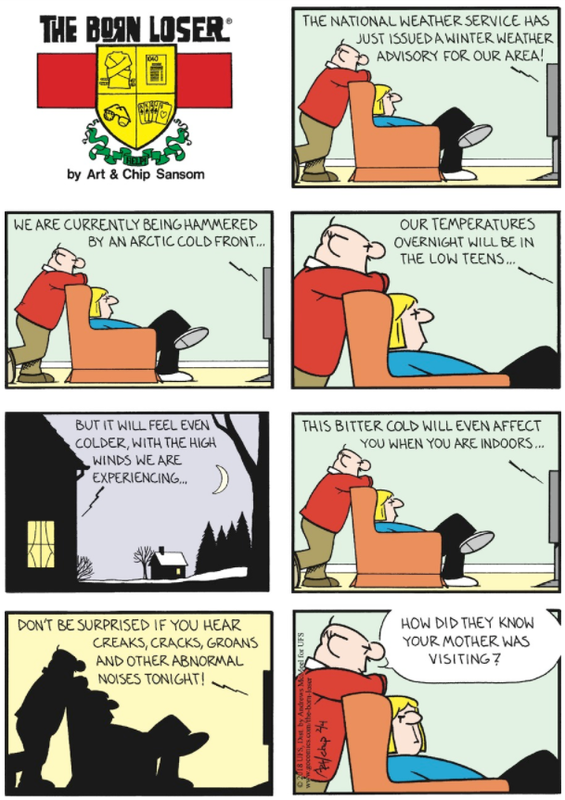 The cold will affect you indoors--you may hear creaks, groans, etc. Are they talking about people or the houses? Either way, it's kind of strange. I'm shocked today's strip isn't about the Super Bowl.